In September 2011, I was in Dhaka, the capital city of Bangladesh, as part of the 3-member delegation from Bhutan representing Disabled Persons’ Association of Bhutan (DPAB) in the first ever South Asian Disability Forum which was held from 19-21 Sept., 2011. On behalf of the team, I was given the opportunity to do a 10-minute presentation on the general living conditions of persons with disabilities in Bhutan. As I pulled the audience through my PowerPoint slides, I talked about how people with disabilities in Bhutan enjoy equal rights and justice in all aspects of life. I even cited the example of how the Royal Government of Bhutan provides equal opportunities to persons with disabilities for employment and scholarships as long as they are capable of competing with their non-disabled counterparts. I further justified this statement by saying that Bhutan is a close-knit society founded on basic Buddhist principles and philosophies because of which people in general are sympathetic and compassionate towards persons with disabilities, and hence, there is no noticeable social discrimination against them. I then talked about some of the challenges currently faced by persons with disabilities in Bhutan such as lack of accessible public infrastructures mostly due to unfriendly geographical topography, inadequate public awareness on the rights and needs of disabled persons and lack of proper facilities like assistive devices that would help persons with disabilities meaningfully participate in the social mainstream. Nevertheless, I concluded my presentation on the note that despite all those challenges, we feel fortunate to be born in Bhutan where the traditional family circle serves as the social cushion for their disabled members and hence, they enjoy the love and care of their family-members and friends at all times. Following the presentation, the floor was opened for interactive question-and-answer session. The questions flew in from all corners. There were representatives from all South Asian countries where disability movements had begun decades and in some cases, even centuries ago. I didn’t realize that some of my statements had contradicted with each other until a female delegate from India bombarded me with a series of thought-provoking questions. The first question she asked me was that if we don’t have accessible infrastructures like public sidewalks and alternative ramps in public buildings such as hospitals and banks for wheelchair users, how would I justify that we don’t face noticeable social discrimination. She said that the lack of commitment and interest from the government and the public sector to build such accessible public facilities despite the needs can also be a form of social discrimination. She also pointed out how I had misunderstood the concept of sympathy and compassion. She argued that even sympathy and compassion can be a part of social discrimination. She questioned me that how many disabled children have been locked up in their homes just because their parents are too sympathetic towards them to let them go to schools fearing that they might get bullied or harassed. She convinced me how sympathy and compassion can deprive persons with disabilities of the opportunities to interact with the outside world, exploring avenues to showcase their talents, and to live an independent life. Yes, after all, she was absolutely right. I had to take back my words and surrender myself to her opinions. Since that day, I have come to realize that although we don’t face much open social discrimination in Bhutan, I agree that we do experience so-called silent form of discrimination at any point of time in life. It may not be always intentional though. We have construction rules on paper that require all public structures such as banks, hotels, hospitals and other public offices to be made accessible for all types of persons with disabilities, but we don’t even have accessible sidewalks to walk across our cities safely. Forget about persons with disabilities, some of our sidewalks are not even safe enough for non-disabled people to walk comfortably. We don’t have ramps for wheelchair users, disabled-friendly services in service-providing organizations, and above all, many agencies, either government or private, are still hesitant to employ people with disabilities despite their right qualification and relevant skills. The worst thing is that we don’t have disability pension as in other countries and 10 percent reservation quota in the job market. Because of the equal-opportunity policy, those disabled persons who have been able to compete with their non-disabled counterparts are enjoying full independence and rights whereas those who have failed to challenge their non-disabled competitors are still left at the mercy of their family. Bhutan has been signatory to the UN Convention on the Rights of Persons with Disabilities (UNCRPD) since September 2010 but five years on, the government has still not even talked about ratifying it. As of now, we don’t even have a policy or an act in place that can protect our rights. 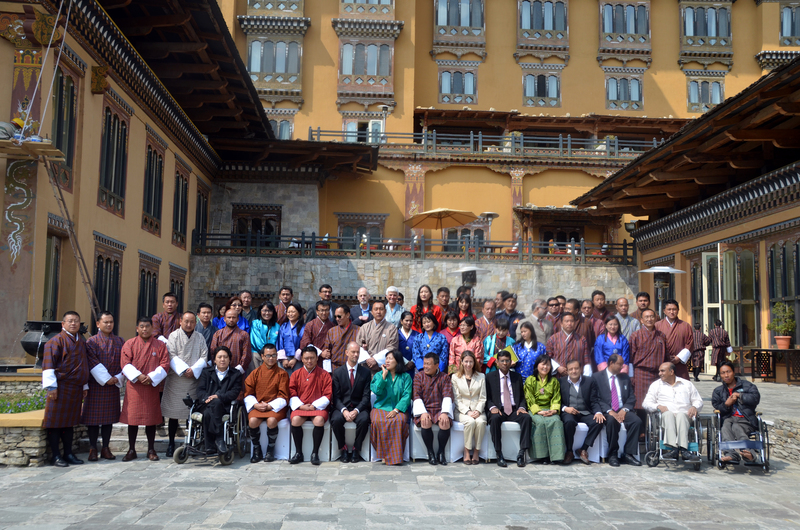 However, I have heard that under Prime Minister Tshering Tobgay’s personal command, the Gross National Happiness Commission is spearheading the drafting of Disability Policy which might help us create an inclusive society in which all the members enjoy equal rights, respect and dignity regardless of their disability status. I keep my fingers crossed that this policy will come into action soon and gradually turn into an act. I was also struck by the fact that even sympathy and compassion can be a form of social discrimination. There have been many a time when I had wanted to go out for shopping with friends but I have been advised to stay back saying they would get me what I wanted from the market. I have realized that while this could be a gesture of sympathetic feelings towards me, it might also indicate that my friends are not so comfortable walking with me in the public. I feel that because of such an attitude, there are many disabled people hidden behind the public curtains. The parents may not send their disabled children to schools or let them mingle with non-disabled friends, simply because they love them too much. This deprives their children of the opportunities to integrate themselves into the mainstream society by acquiring appropriate independent living skills. Therefore, we don’t want sympathy. We want empathy. We want people around us to understand who we are as a human being, rather than simply sympathizing with us for our disabilities. Empathizing does not only mean being in our shoes but also recognizing our needs and dignity of life and this should guide and direct all policies towards promoting an inclusive society for all. You may not see so many disabled people in the public but that doesn’t mean that we don’t have many of them. Most of them still remain behind closed doors mainly because of the lack of accessible infrastructures and facilities that literarily block their way to the public stage. So, let us all work together towards creating a society that respects the rights and needs of all its members.